Fuel Moto teamed up with Area P and original inventor (Kerry Bryant) of the Elliptical Disc System and incorporated dynamic evolutionary improvements to one of the best exhaust system designs ever created. Horsepower, Torque, Air/Fuel Curves, Throttle Response and Sound Levels have never been so easy to adjust – Tunable performance at its best; E-Series Exhaust Systems. Every single E-Series exhaust system model is put through an extensive R&D process that includes power, sound, air/fuel curves, mapping, fitment and finish. No detail is left undone. Then, and only then, are all tooling and fixtures developed for manufacturing and production of the finished product that has now arrived to you. 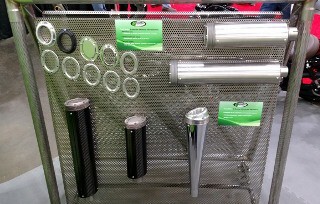 Fuel Moto & Area P have an unparalleled history of R&D, Engineering, Design & Manufacturing experience. We have three Dynos in state-of-the-art Dyno rooms; Dynojet Model 250I, Dynojet Model 200i, and Mustang MD-AWD-500 Series all-wheel drive dyno. 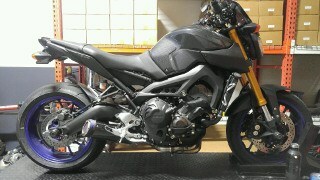 We can Test, Map, Data log any Motorcycle, UTV/SxS Sport, or Automobile. Your engine is essentially a big pump and our goal is to increase efficiency by creating more pumping affect. As the exhaust valves open, a wave of energy is generated which travels down the pipe. When it reaches the end of the pipe, negative pulse is reflected in the reverse direction. If the length of pipe is adjusted so that the suction wave arrives back at the exhaust valve just before it closes, a vacuum is created, allowing the cylinder to be charged with a purer mixture. The inertia in one moving exhaust packet assists the flow of the next charge. A purer mixture can now enter each cylinder, resulting in stronger explosions and more power. The wave of negative pressure produced is a combination of high energy and short duration. Essentially, this effect produces an increase in power over a relatively small RPM range, however a wider power band can be created with the use of a diffuser. The E-Series Disc is a radial elliptical diffuser. When exhaust pressure/flow reaches atmosphere, the angular direction of the disc allows it to flow out and back like a conventional outlet. Basically, a diffuser creates suction waves with a lower energy peak and longer duration. A simple way of understanding the process is thinking of a diffuser as creating a continual series of suction waves, providing effective cylinder scavenging over a much wider RPM range. 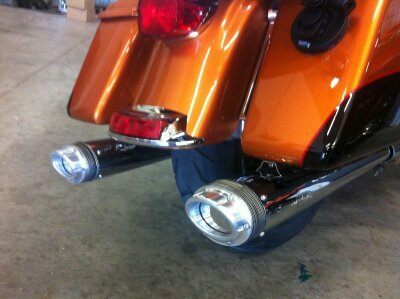 When combined with a properly designed exhaust system, they both cause a suction effect. They both create diffusion as well as static & dynamic pressure. They both work on the “Bernoulli Equation” affect, relating total flow of energy being made up of two components (static & dynamic pressure) and are a constant. In other words, the total power or energy stored in the flow is the same at every point. As one component changes, the other changes the opposite amount to keep the total the same. So as the flow area decreases, the velocity must increase (and vice/versa). A carburetor “venturi” is a good example. At the throat of the venturi, the area is smaller and the velocity is greater than at the inlet or outlet. Consequently, the static pressure at the throat is lower and creates a suction. With the E-Series Discs – the final exit velocity where the exhaust enters the atmosphere is reduced because the exit flow area is now larger. Since the exit pressure is atmospheric, the static pressure at the inlet of the E-Series Discs is below atmospheric. Below atmospheric pressure means that there is now a suction. The E-Series Diffuser Discs create a similar affect as a megaphone, with the added benefit of being easily and readily tunable, as well as dispersing and dissipating the sound level energy over a broader area. The E-Series Discs allow you to adjust Horsepower, Torque, Air/Fuel Curves, Throttle Response and Sound Level in minutes. 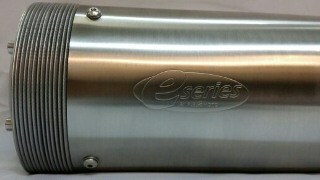 E-Series - Engineered to provide the best combination of horsepower, torque, sound, and throttle response. Offering the perfect balance of tunability and performance. Watch for more Offroad UTV/SxS Sport models, along with select Sportbike and H-D applications coming soon!